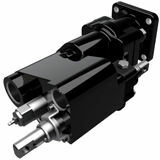 Parker’s SG102 fixed displacement gear pumps offer high performance and high endurance due to its cast iron construction. 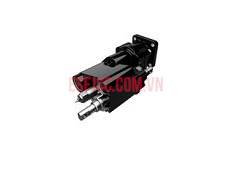 The SG102 Dump Pump is part of Parker’s family of Commercial Hydraulics truck pumps. Building upon the technology of the industry standard C102/G102 pumps, the innovative SG102 Dump Pump provides a 37% faster dumping cycle versus the standard G102. The pump is designed to fit where space is limited, but greater flow is still a necessity. The SG102 Dump Pump utilizes the valve body of the larger frame size C Series dump pump, providing large dump pump flow characteristics for a faster dump cycle time, yielding greater work cycle efficiency. The dump truck industry will benefit from the improved power density as well as safety due to the quicker cycle time for the bed to return prior to the operator moving from the job site location.